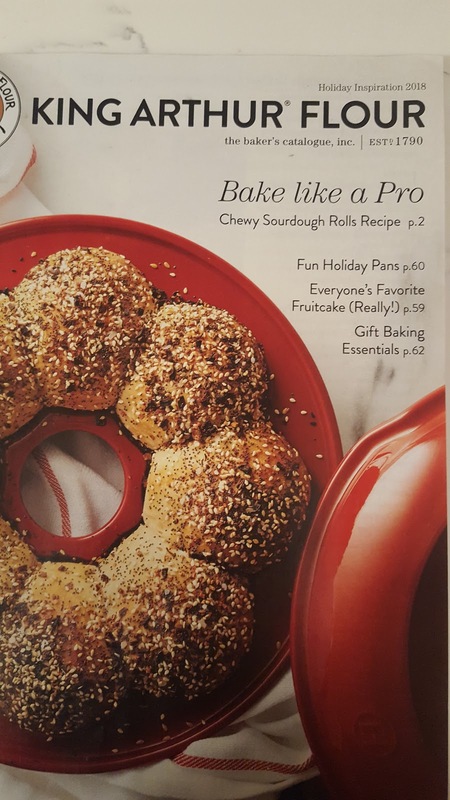 Guest Post, and Food Network Magazine! Hello all, and happy fruitcake season! I hope that yours are all ordered, or are freshly baked and soaking up some tantalizing liquor in your basement/garage/fridge/mouth. I've been quite busy at work so unfortunately didn't even get around to baking fruitcakes this year, however my friends did, so I will be posting soon about our annual fruitcake tasting. 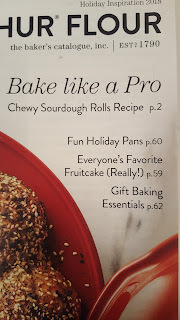 The December issue of Food Network Magazine contains an article on fruitcake where I'm quoted. Looks to be a really interesting article on fruitcake's resurgence, to which I proclaim a loud HUZZAH! I believe the article is currently only in their printed magazine so by all means pick one up. If you're here because of that magazine article, welcome and please take a look around! You can also like my Facebook page and join other fruitcake lovers there. Until further posts, please enjoy a guest post by Jay Martin, where he describes his love for a good monastery fruitcake and provides some great links and reference at the bottom. Please excuse the differences in font -- in the interest of expediency I will post it as is. Every year my mom sends my brother a fruitcake. This year her source dried up, a clothing catalog called Norm Thompson. Her fallback source, the Vermont Country Store, didn’t have the right kind of fruitcake, which is baked by monks in Oregon. My mom asked for help. I stalled. You see, I’m the son who likes fruitcake. Years ago my mom confused my brother with me somehow. Maybe my brother likes fruitcake too, or maybe he’s just been gracious. Either way my brother has received at least 14 Christmas fruitcakes that should have been mine. I searched Google for monks selling fruitcake. The Oregon monks my mom remembered weren’t even the first search result. Impressed, I started a list. Google showed six monasteries, then I found Mondo Fruitcake which knew about two more, and then I found some nuns. The nuns in New York and the monks in Michigan are Orthodox, but most are Trappists, monks who stay silent at meals. I’m the son who eats fruitcake. 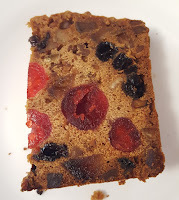 I’m the son who in a Christmas show attempted to eat an entire fruitcake in the time it takes to sing “The Twelve Days of Christmas.” I was going to succeed too, until the singers sped up. 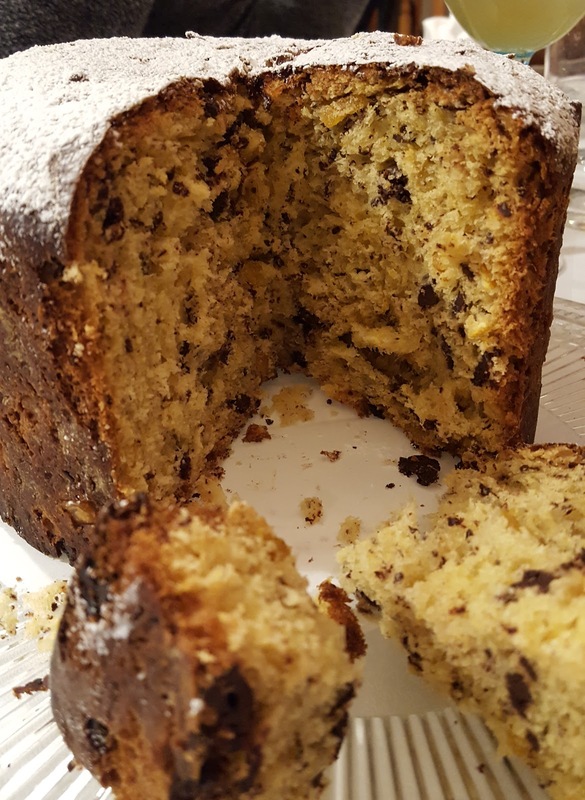 The Michigan monks bake a four-and-a-half pound fruitcake. The Kentucky monks go up to five pounds. I added those details to my list. All the monks douse the fruitcakes. My mom was surprised to hear that fruitcakes have rum in them—or peach brandy if your monastery is in Georgia. I assured her that was the regular recipe. I’m the son who baked fruitcake. I baked professionally, briefly. I worked at Jen’s Hawaiian Bakery Café in Santa Cruz, California. We used dried pineapple and tropical fruit. We moistened our fruitcakes with guava concentrate. I sorted my list. Most of the monasteries were established in the years after World War II. Many young men sought a religious life after the military, including my dad. I showed the list to my mom, and she chose the California monks, who are Camaldolese. It's a monastery we think my dad visited. My brother got my dad's religious side, which might explain my mom's confusion about which son should receive a fruitcake baked by monks. I ordered the fruitcake for my brother. I’m the son who knows fruitcake. After I placed the order, I came back to Mondo Fruitcake. Isabelle has tasted all the fruitcakes from monks (and fruitcakes from 26 other sources). I looked at her ratings. The fruitcake I ordered my brother wasn't number 1. Isabelle likes best the one she had as a child, which her mom still sends her every Christmas. Without telling my mom, I ordered Isabelle's favorite fruitcake for myself. Here is a list of monks and nuns who sell fruitcake online as of Christmas 2018. Prices are rounded to the dollar and include shipping but not rush shipping. Fruitcake season is here again....and yes, fruitcake is coming back. And oh, what's that in the upper right? What does that say? Let's zoom in a bit, shall we? 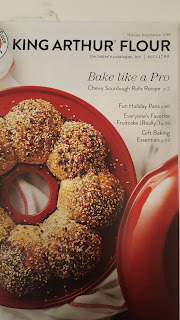 When fruitcake starts making it to the front of the King Arthur flour catalog......I call it a resurgence. 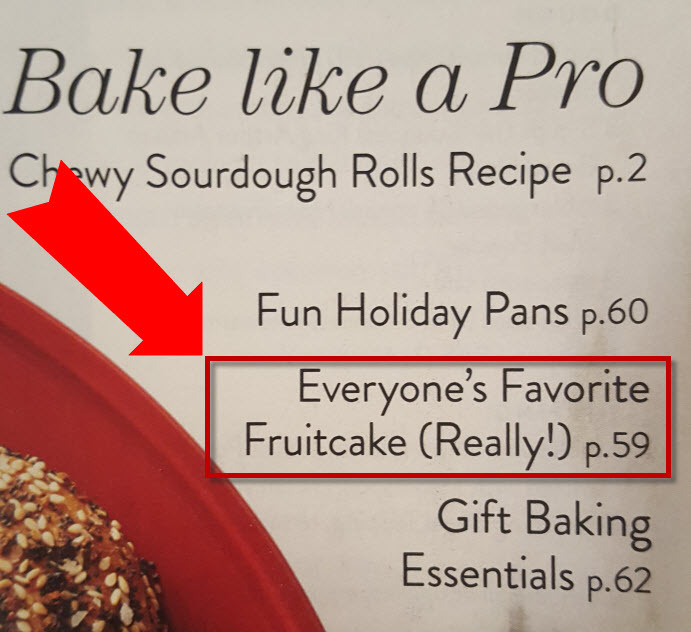 Seriously, though, the latest catalog contains several different fruit blends in addition to their standard fruitcake blend...resurgence. They also have some nice sounding organic candied lemon and orange peel from Spain....fruitcake resurgence!! That peel,though....limited time only, and 8 ounce packages are $16.95 per. Pricey. Nuts.com has candied orange peel for $6.99/pound. I've used it and it's good quality. Maybe I'll try the King Arthur, but even Market Hall foods has imported Italian orange peel for $17/pound, and it's very nice. Which all leads to how I started this post. 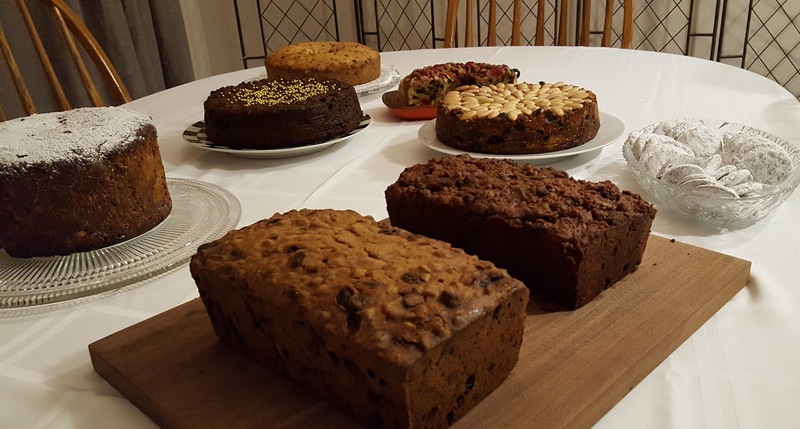 It's getting to be the time to start thinking about making and/or purchasing fruitcakes! I'm considering making the Sailor Jerry fruitcake, and then an intriguing one that is supposedly from 1957 and contains crystallized ginger. Remember that I have tons of fruitcake recipes collected on my Pinterest board. Are you thinking about your fruitcake baking/purchasing? Let me know what you're planning on my Facebook page! I was recently quoted in an article in Adweek about fruitcake. It's an excellent article about the history of fruitcake, how it may have received its bad reputation, and why there is that silent group of people (hello, person reading this blog post!) who actually love fruitcake. So why not fruitcake? Why not you, why not now? You might be buying local already--your beer, your bread, your alcohol, your pickles, your food. Why not find a local person making fruitcake and buy/try it? Or better yet, make it yourself? Granted, maybe you just don't like it--you don't like the spiciness, or the nuts, or you don't like the texture of all the fruit, That's fine (my husband, God bless him, doesn't like it). Don't eat it. But...have you even tried it? Fruitcake has a lovely, long tradition of being a condensed expression of a good harvest, of abundance, of hospitality, of care, and of love. For those reasons alone, give it a try. Happy Holidays! Happy Winter! Happy New Year!